Caves of Time « "TeresaBruceBooks"
I was about to embark on a trip back in time that made me question the nature of time itself. I’ve never been one to ponder many existential questions; I’m too busy setting goals and rushing to meet them to do anything but wonder where time went. But after a morning at Bandelier I’m no longer sure what constitutes wasting time. Consequently I probably am, just thinking about it. In school, natural history never seemed as interesting as it did in the James Michener books I stole from my parents. But in the Frijoles Canyon history is mockingly relevant. I’ve felt the awe of National Parks before – the way places like Yosemite make you feel so puny and inconsequential. But at Bandelier it wasn’t just the physical grandeur of nature that humbled me, it was that damn first line of the brochure: evidence of human activity. Somehow, in this most isolated and environmentally harsh place, ancient peoples not only survived but thrived. I was worried whether I’d get carsick on the shuttle ride out of the canyon but the Ancestral Pueblo people contended with threats monumentally more serious. The heat, for one thing. It reached 97 degrees on the day I visited — a dry, high-altitude heat that reminds you that a few days without water and you’d be a pile of bones picked over by coyotes. These amazing people, without the wheel or a single written instruction, literally carved a life out of a desert canyon. Which brings me back to the human activity part. The Ancestral Pueblo people figured out how to use tools to enlarge the openings of small, natural caves in the canyon’s cliff face. It’s called Tuff rock – the eroded remains of volcanic ash that compacted over time. It conserves the coolness of the desert night. It also serves as a permanent blackboard for ancient attempts at art. I say attempts because the figures and symbols seem less visionary and inspirational than utilitarian. If there were creative outlets for these ancient people they were stories, songs and dances lost to time. You can still climb into the caves at Bandelier and see the discolored walls where fires burned thousands of year’s worth of nights ago. What stories got told around those fires? Were the cave dwellers dreaming of enough free time to pursue the arts or new worlds to explore? Or were they just staying warm? I tried to imagine me in this village, ten thousand years ago. Would my life have had meaning or true fulfillment? What “human activity” would have kept me motivated? The Ancestral Pueblo people had religion- their faith was part of every aspect of their lives without sectarian separation. I do not identify with any one religion. I have no useful farming skills. I don’t even have children. If more than a weekend goes by without writing something I get fidgety. I feel like I’m wasting time and yet I have more of it to fill in the manner I choose than the Ancestral Pueblo could even imagine. It’s the mark of progress, we’re told, when labor becomes so specialized that not everyone has to spend their days on redundant, common tasks of survival. Yet what does it all mean when “progress” means spending hours each day tweeting and blogging? It’s part of every writer’s job – building a platform so that readers will buy the books that keep publishers in business – so I’m not complaining. But is my multi-tasking life really any more advanced than the brochure’s hunting, weaving and heavy construction? My gut says no, but my brain says it is more fulfilling. I’m happiest when I’m swimming in the creek in front of my house — thinking of nothing and thankful for everything — but I couldn’t let myself float in that happiness if I didn’t spend the days planning the next project, the next challenge. I can change the circumstances of my life at will if my will is strong enough. 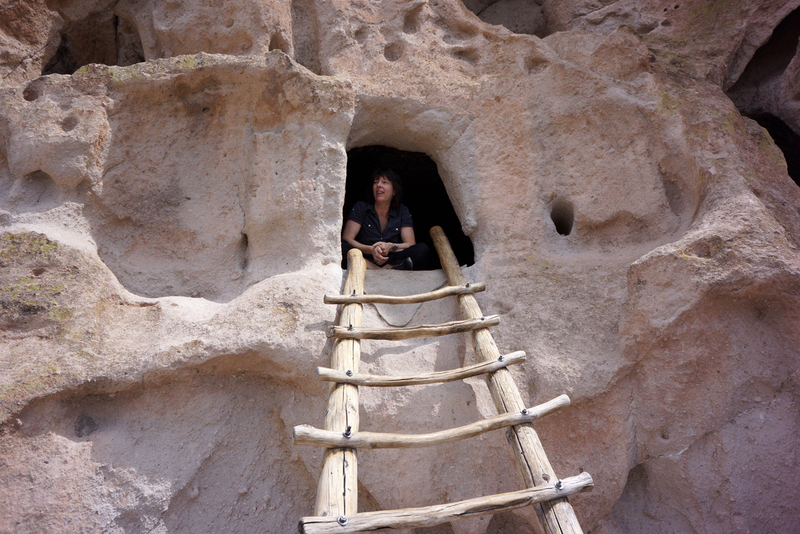 The caves of Bandelier haven’t left my thoughts since I returned to South Carolina. I keep going back to that cool, dark window on a world I can barely imagine. The closest I can come to understanding what the “human activity” of survival was like ten thousand years ago was how it felt when Gary and I drove through Latin America in a camper. Despite all my mental fidgeting and fastidious documentation for a future book, we had to stop driving by two each afternoon to begin the menial tasks of finding a place to camp, buy food, get water and bathe. I was happy. I learned I could survive without alarm clocks and internet access and deadlines. But would I choose that “simplicity” permanently? No. I need external stimulation like art and museums and daily challenges to what I think I know. Bandelier made me appreciate just how little that is. This entry was posted in travel and tagged New Mexico, Pueblo People, Time, writing. Another place that makes you feel like you’ve left the corporate world, even the country, behind. Sounds to be that this place has a haunting air. Do you think that while the Anasazi have vanished, their spirit remains?. I felt their spirit energy there – they haven’t really left! I don’t think anyone chooses simplicity permanently; they fill it with details. Like you said, songs and dances and stories around the fire. Those were their museums. The human imagination is always at work. I felt the same when I visited the pyramids of Mexico. It was a huge city and then it disappeared in under the growth of debris of time. It was discovered only eighty years ago. Who knows what else is out there or under the waves. Whole civilizations gone and we think we are invincible. We went through that park when in New Mexico. Unfortunately neither or us realized we could climb into the cave dwellings. But no matter, I loved the area! Good excuse to go back! That is really neat! So much beneficial information. I really enjoyed sharing with my friends. Good point there. It’s easy to get complacent with the things we have and idealize times that never were in the past, but as much as the human experience might not change through the centuries, the human psyche probably does (for better or worse) once the majority in a society get to have the chance to luxuriate of thinking about something more than “survival,” as you pointed out. I have the exact same photo of myself at Bandelier, which is what led me to click on your article on Freshly Pressed. My sister lives in Los Alamos, which has allowed me to visit Bandelier a number of times over the years – even before you were required to take a shuttle, before the fires and consequent floods. And each time I have visited, I’ve found myself examining this modern life of ours in the context of the lives the Ancestral Pueblo people who populated this spot. One thing I have noticed, after visiting many of the ancient pueblos, is that the natural beauty of these spots, in the midst of harsh desert landscapes, lends itself to imagining daily life there. And to comparisons with our hectic (and as you said) multi-tasking lives. I find it awakens a desire in me to live a life stripped down to the basics: food, shelter, human interaction, beauty. I would, in those moments, gladly give up my smart phone, high-speed internet connection, traffic, etc. in exchange for a cave, a cool stream, and a life lived completely in the moment. Then I remember that this idyllic picture is just my own imaginal creation – and that my hips feel better when I sleep on a mattress. The gift of places like Bandelier, for me, is that they remind me there just might be a sweet spot somewhere between primitive and post-modern that I can find and create in my own life. Thanks for posting your thoughts – and giving me this chance to revisit one of my favorite places! Excellent – thank you for sharing your experience. Lovely post. Ancient monuments always throw up difficult questions for us to reflect on – Like the idea of progress or the more problematic question of how useful I am, individually, in taking forward this progress with the little skills I have. Bandolier is one of my very favorite parks, a place I’ve been able to visit now and again over a long period of time. I too, have a similar photo of myself, and a nice art print view of the canyon from above hanging in the living room right now. We’ve certainly changed, but have we truly progressed… if we have, I suppose it is in definition more so than meaning. Lovely reflective story. Thanks for sharing. Beautifully told. Enjoyed it immensely. Thanks for sharing this. I often get philosophical around ancient monuments and buildings, wondering how people would have lived in those days, what their aspirations and fears were. In the end, they were human like the rest of us and we probably have a lot more in common with them than we think. Reblogged this on dima hanii. The farthest I’ve gotten from the comfort of my own bed is Ecuador, but this is awakening my itch to travel again. Hopefully this time with my son by my side. Thanks for sharing!